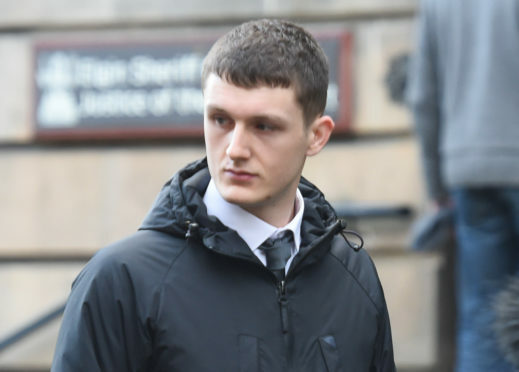 Gavin Wallace admitted running an illegal drug enterprise from his parent’s house on Maisondieu Road in Elgin after police searched it and found illicit substances and illegally obtained cash there. The 25-year-old had first been pulled-over by police officers after being spotted driving erratically. When questioned, a smell of cannabis was detected coming from the vehicle, with a search revealing he was in possession of four individual bags of cocaine and two containers filled with herbal substances. His mobile phone was also ringing constantly, with a variety of different numbers visible to officers on his handset. Under questioning, Wallace admitted he was dealing drugs and when police further investigated his phone they discovered the contacts were looking to source drugs. A subsequent search of his parent’s home revealed cash bundles containing over £18,000, plus cocaine with a street value of £4,400 and a smaller sum of cannabis worth £815. At Elgin Sheriff Court yesterday, defence solicitor Brent Lockie stressed his client’s honesty and candidness in replying to the police and suggested alternatives to custody could be handed down. He said: “His involvement here will be a very familiar one to these courts. He initially just took the substances and then began dealing to pay for it. “It then became too easy for him to make money. Wallace pled guilty to being concerned in the supply of cocaine and cannabis between January 1, 2017 and January 14, 2018 at an earlier hearing. Sheriff Phillip Mann took Wallace’s honesty into consideration for sentencing but said he had to deliver a sentence that would deter others from taking the same course of action. He said: “Your honesty has gone in your favour and I have no doubt there were reasons for you to embark on this course of drug dealing. “It is an all too familiar story for young men who develop a drug habit and then let it spiral out of control. “Mistakes can be made in life but your mistake has been spectacular as this was a substantial operation, through which you amassed in excess of £20,000.